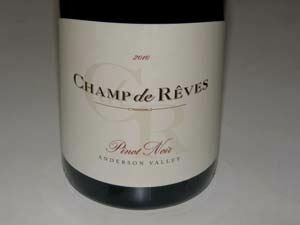 An artisan Anderson Valley winegrower producing exclusively Pinot Noir from Boon Ridge Vineyard. Situated at 1,300-2,000 feet above Boonville, the vineyard is a patchwork of small blocks planted to seven different Pinot Noir clones. Decomposed sandstone provides superb drainage while naturally restricting vine vigor and yields. The key blocks are planted to Dijon clones 667 and 777 and Pommard 5 clone. The Boon Ridge Vineyard was formerly part of the Edmeades Winery and had not been developed for years. It was planted to Pinot Noir in 2006. Winemaker Eric Johannsen has over a decade of experience in Pinot Noir winemaking in California including stints at Cuvaison, Williams Selyem and La Crema. He crafts the wine in Windsor, CA. The wine is sold through a mailing list with limited retail distribution. The 2010 vintage yielded 3,200 cases but will double in 2011. A joint tasting room with Edmeades is located in Philo, housed in the original Edmeades winery site which has been closed to the public since 2002.